We present a new model for pricing electricity swaps. Two general factors affect contracts but unique risk elements affect each contract. General factors are average swap prices and deterministic trend-seasonal components, and unique elements are forward premiums. Innovations follow MNIG distributions. We estimate the model with data from the European Energy Exchange. The model outperforms four competitors, both in in-sample valuation and in out-of-sample forecasting, and in fitting the term structure of volatilities by market segments. Competitor models are (i) diffusion spot prices, (ii) jump-diffusion spot prices with time dependent volatility, (iii) HJM-based and (iv) Levy multifactor model with NIG distributions. Value-at-Risk measures based on normality strongly underestimate tail risk but our model gives estimates that are more exact. The original rationale for adopting daylight saving time (DST) was energy savings. Modern research studies, however, question the magnitude and even direction of the effect of DST on electricity consumption. Representing the first meta-analysis in this literature, we collect 162 estimates from 44 studies and find that the mean reported estimate indicates slight electricity savings: 0.34% during the days when DST applies. The literature is not affected by publication bias, but the results vary systematically depending on the exact data and methodology applied. Using Bayesian model averaging we identify the most important factors driving the heterogeneity of the reported effects: data frequency, estimation technique (simulation vs. regression), and, importantly, the latitude of the country considered. Electricity savings are larger for countries farther away from the equator, while subtropical regions consume more electricity because of DST. Forecasting China’s Carbon Intensity -- Is China on Track to Comply with Its Copenhagen Commitment? In the 2009 Copenhagen Accord, China agreed to slash its carbon intensity (carbon dioxide emissions/GDP) by 40% to 45% from the 2005 level by 2020. We assess whether China can achieve the target under the business-as-usual scenario by forecasting its emissions from energy consumption. Our preferred model shows that China's carbon intensity is projected to decline by only 33%. The results imply that China needs additional mitigation effort to comply with the Copenhagen commitment. The emission growth is more than triple the emission reductions that the European Union and the United States have committed to in the same period. 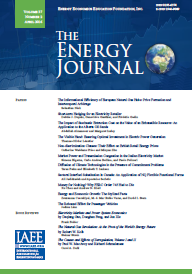 This paper examines the effects of procuring alternative sources of natural gas on Russian pricing in Europe. With the increasing presence of LNG import capability in European ports, this topic is growing in importance, especially for European policy makers. Theoretical results, stemming from an asymmetric Nash Bargaining model, suggest that Russian prices decrease as dependency on Russian gas decreases. The empirical results, obtained from the estimation of a correlated random effects model, corroborate this stipulation by finding a positive relationship between Russian pricing and average dependency on Russian supplied gas. These findings explain the recent phenomenon experienced in the Baltic Region where the presence of an LNG import terminal in Lithuania has secured access to non-Russian suppliers of gas and decreased prices from Gazprom. This paper analyses recent energy intensity trends for 40 major economies using a structural decomposition analysis. Our focus lies on the question whether improvements in energy intensity were caused by structural change towards a greener economy or by technological improvements. We account for intersectoral trade by using the World Input-Output database and adjust sectoral energy use via the environmentally extended input-output analysis. We find strong differences between consumption and production-based energy consumption across sectors, particularly in the construction and electricity industry. Using the three factor Logarithmic Mean Divisia Index method, our decomposition analysis shows that recent energy intensity reductions were mostly driven by technological advances. Structural changes within countries played only a minor role, whereas international trade by itself even increased global energy intensity. Compared to a previous study only using production-based sectoral energy data, we find structural effects on energy intensity reductions to be systematically weaker under consumption-based data. In this paper we employ a dataset of three dimensions - state, sector, and year - to estimate the short- and long-run price elasticities of state-level electricity demand in the United States. Our sample covers the period 2003-2015. We contribute to the literature by employing instrumental variable estimation approaches, using the between estimator, and pursuing panel specifications that enable us to control for multiple dimensions of fixed effects. We conclude that state-level electricity demand is very price inelastic in the short run, with a same-year elasticity of -0.1. The long-run elasticity is near -1, larger than often believed. Among the sectors, it is industry that has the largest long-run price elasticity of demand. This appears to in part be due to electricity-intensive industrial activities clustering in low-price states. OPEC claims to hold and use spare production capacity to stabilize the crude oil market. We study the impact of that buffer on the volatility of oil prices. After estimating the stochastic process that generates shocks to demand and supply, and assessing OPEC's limited ability to accurately measure and offset those shocks, we find that OPEC's use of spare capacity has reduced price volatility, perhaps by as much as half. We also apply the principle of revealed preference to infer the implicit loss function that rationalizes OPEC's investment in spare capacity and compare it to other estimates of the cost of crude oil supply shortfalls. That comparison suggests that OPEC's buffer capacity was in line with global macroeconomic needs. Demand-side Management (DSM) programs by electricity utilities report substantial energy savings that often receive little support from empirical studies. We argue that this discrepancy results from an inherently static view of technology adoption by utilities when estimating future energy savings. We illustrate this through a simple model of technology adoption, in which households operate different vintages of appliances and have heterogenous forecasts about the rate of future technological progress. An "energy efficiency gap" arises when households under-estimate the true rate of technological progress. We parameterize the model using data on refrigerators and show that a DSM program that subsidizes adoption of energy-efficient refrigerators yields small energy saving that, in most cases, do not justify the cost of the subsidy. Although technological progress can alter the relative costs of different energy sources, fossil fuels inevitably will be displaced as depletion raises their costs and makes them uncompetitive. They may be displaced sooner if they are taxed to internalize negative externalities. Currently, wind generation or nuclear power, supplemented by bulk electricity storage, are the most feasible alternatives to fossil fuels for electricity generation. The ERCOT ISO in Texas provides a realistic model for examining the costs of replacing fossil fuels by wind generation and storage, and for comparing wind power with generation based on nuclear and storage. ERCOT is relatively isolated from neighboring grids, and wind power was almost a quarter of its total generating capacity at the end of 2016. Using the ERCOT example, we also discuss how the long-run configuration of the electricity supply system affects evolution away from a system dominated by natural gas. This article unveils the dependence structure between crude oil prices, exchange rates, and the United States interest rates. We begin by using asymmetric GARCH models to examine the marginal behavior of the returns, and then various copulas are used to understand extreme market co-movements. We also investigate the causal relationship and the spillover effects by using the Granger causality test and the BEKK representation of a multivariate GARCH process. Over the 1998-2017 period, we find evidence of an inverse relationship between the U.S. interest rates and the crude oil prices. Oil-exchange rate linkages become stronger for most of the oil dependent countries considered in this article in the aftermath of the global financial crisis. There is also asymmetric tail dependence for almost all of the oil-exchange rate pairs. The results of Granger causality tests mainly indicate that crude oil prices Granger cause exchange rates. We also find that there are unidirectional volatility spillovers from WTI to exchange rates for oil exporting countries and to the U.S. interest rates. These findings provide important implications for investors to hedge the possible risk with international portfolio diversification.